Poor field conditions didn’t deter American River College’s women’s soccer team in its 2-0 win against Yuba College, resulting in the team’s second consecutive shut out. Several pockets of water were spread out throughout the field, making for a slippery play surface. The condition of the field visibly affected both teams. “The conditions were kind of rough today, our passes weren’t able to finish because the puddles would stop them, so that was pretty difficult,” said sophomore goalie Stephanie Doss. ARC started slow in the first half as Yuba getting three early shots on goal, all of which were deflected by Doss. “The first half we played like we had already won the game,” said ARC head coach Paul Arellanes. “The second half we played with a little more urgency. A little more desire,” Arellanes said. ARC picked up its pace as the match continued, with the team’s exchanging shots on goal throughout the latter part of the first half. Yuba was aggressive in the offensive zone but was unable to score despite four shots on goal. “We played a pretty good game, we’re starting to come together as a team,” said Doss, who finished the match with two saves. “I think we played pretty well as a team, now we’re ready for Fresno,” said Holtzen. ARC forward Theresa Cooper scored the game’s only other goal in the second half on an assist from defenseman Whitney Pickard. Arellanes said he is optimistic and looking towards the team’s next game at Fresno City College. 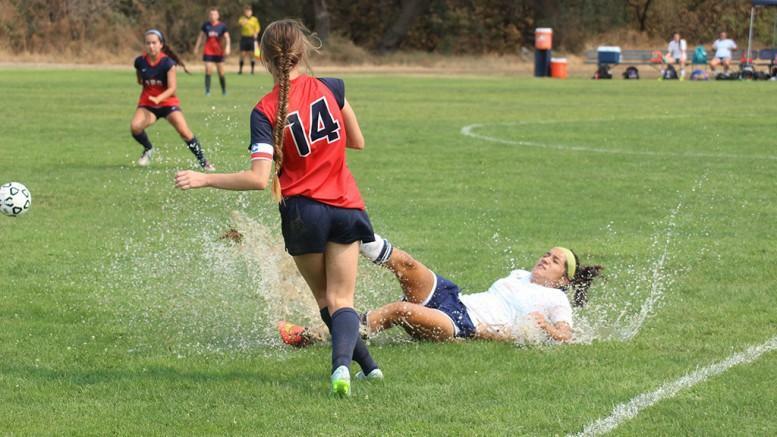 Be the first to comment on "ARC women’s soccer team defeats Yuba College 2-0 on water soaked field at ARC"